First the gentle and non-threatening evidence! You draw the drapes and turn on the lights and there is an immediate pattering of insects on the window all sounding as if they are splattering their tiny bodies to approach your light. Modern buildings are all fully screened but the screen door into my family room must not be perfectly fitting any more. I have been finding quite large beetles caught between the screen and the inner glass door. I have simply opened the outer screen and brushed the beetle out on to the path. First the magpie found these additions to its breakfast but then blue-faced honeyeaters, 'leatherheads' and 'peewees' came along and some of them even stood outside the door and scolded me when they did not find a beetle to eat. Temperatures have been variable with the BOM ( bureau of meteorology) predicting storms nearly every day, But it did not happen until last Thursday, There was an article up on their web site explaining why summer storms were so hard to predict too early. There was plenty of time for the warnings but no-one predicted how bad this one would be. This photo was taken out my back door - I cracked it open a few inches and closed it again ASAP. That hail was bouncing off the ground. I now see that lots of palm leaves were shredded - especially the leaves which are normally fan shaped. 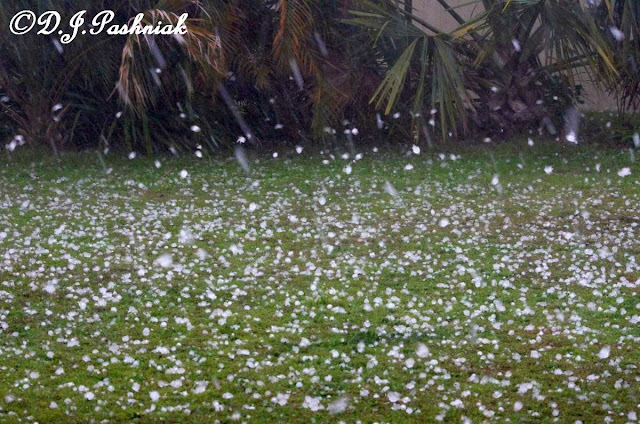 Fortunately this hail did not last too long at my place and I missed the big winds but I was lucky! Water poured into the big shopping center food store just a few blocks away. I was told they worked all night to clean up and dry out . There are horror stories being reported from all around. The worst I have read is a young mother who was in a car - pulled off the road because the rain got too heavy and then the hail started and broke the back window - her baby daughter was in a car seat back there so she dived over the seat to cover the baby with her own body and ended up bloodied and bruised but protected her daughter.. Agricultural damage still has to be assessed but whole crops were wiped out. Houses have been damaged everywhere. My friends in Gympie think they are lucky because they just lost one window. This kind of summer storm is not unheard of but I am glad they don't happen too often. For more happenings from around the world visit Our World Tuesday. We seem to be having more instances of extreme weather all over. I must say I prefer our few days of higher than average temperatures to your destructive hail shower. Such events have been recorded in the Uk but fortunately very rarely. It must be so frightening to be in the midst of a storm of that strength. I hope I never have to experience it. Wow, the hail storm sounds awful. I hope the mom and the baby were ok. The photo of the hail is amazing. Enjoy your day and have a great new week! Oh my gosh -- I had no idea that you'd gone through such a terrible storm. Wow -- hope that is the last one for the season. What a scary story for the young mother, but thank goodness her instincts and quick reactions protected her baby and she will recover. On a lighter note -- do keep on sweeping out those beetles -- you don't want those honeyeaters to have to scold you again !!! Wild, Wild weather everywhere ~ neat photo! that's amazing. Your hail stones when they arrive must be quite frightening. It doesn't fit my perception of Australia at all. What magnificent hail. And what a harrowing story about a mother and her child. There certainly is wild weather in just about every corner of the world it seems nowadays. I’ve been so wrapped up in the news of storms closer to home that I'd not heard about this. Thanks for sharing. We need to know and we need to elect people who see the significance of what's happening everywhere. yes I read that story about the hail, I've never see it that bad or that big. Seems winter likes to throw out a last minute blast. It is fascinating to see hail falling! Wow to your hail! Can't happen that often. Wow I saw that on TV. It must have been scary for you and everyone in your town. That mother was brave but I guess anyone would do that to save your child. Great shot of the hail bouncing.